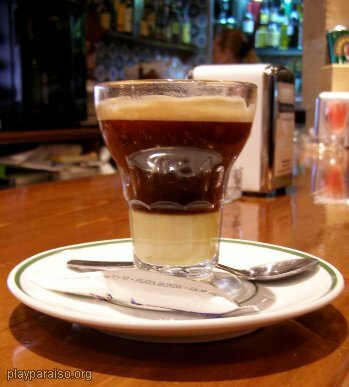 Asiatico is a very popular liqueur coffee which only seems to be made in this region of Spain. It is usually served in a small heavy conical glass and has several layers of ingredients. At the bottom is condensed milk, then there is a layer of strong (expresso) coffee, with generous measures of brandy and local liqueur Licor 43 (or sometimes Amaretto) on the top. This is topped with foamed milk and cinnamon. Apparently, it should be stirred before drinking. A really authentic Asiatico will be served with a small piece of lemon peel and two roasted coffee beans floating on the top. It is a wonderful creation and especially good for bad backs!